Mr.R at 2GG: Hyrule Saga. 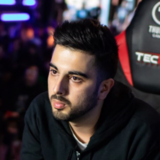 Mr.R is an SSB4 Sheik player with a strong Cloud secondary from Mahabad, Iran, who is currently residing in the United States, and is considered one of the best Sheik players in the world, along with VoiD. Beside VoiD, he is a major pioneer and influence on the Sheik metagame, developing and optimising kill set-ups and low percent combos. Mr.R is currently ranked 1st on the Dutch Smash 4 Power Rankings, 1st on the European Smash 4 Power Rankings and 10th on Panda Global Rankings 100. He is the undisputed best player in Europe, and currently dominates the continental tournament scene. Smashdown World is currently the only European tournament he has failed to win, placing 5th, losing to Japanese players komorikiri and Kameme. In SSBB, Mr.R was a Marth player, and was considered one of the best Marth players in the world, alongside Mikeneko, and was Europe's best player. He was well known for his flashy playstyle, earning comparisons to prominent French Marth player, Leon. Mr.R is currently ranked 17th on the 2016-2017 SSBBRank. On January 20th, 2017, alongside False, Mr.R was signed by Elevate. On April 19th, Mr.R announced his free agency. On July 9th, he was signed by startup organization beastcoast, along with Melee player MikeHaze. Mr.R is known for preferring to put milk in the bowl first whenever he has cereal. Upon its revelation, this fact became the subject of considerable playful scrutiny in the Smash community and evolved into a popular meme, to the point of his name being a trending topic on Twitter in North America. Mr.R is known for getting horrible luck in his matches, so much so that it's become a joke inside the smash community. Mr.R has also been known for getting "janked out" constantly by characters who benefit a lot from rage and has appeared on several "Top 10 Mr.R Getting Bodied" videos. ↑ beastcoast signs Mr.R and MikeHaze. ↑ Mr.R milk first meme explanation and examples. This page was last edited on April 21, 2019, at 16:17.